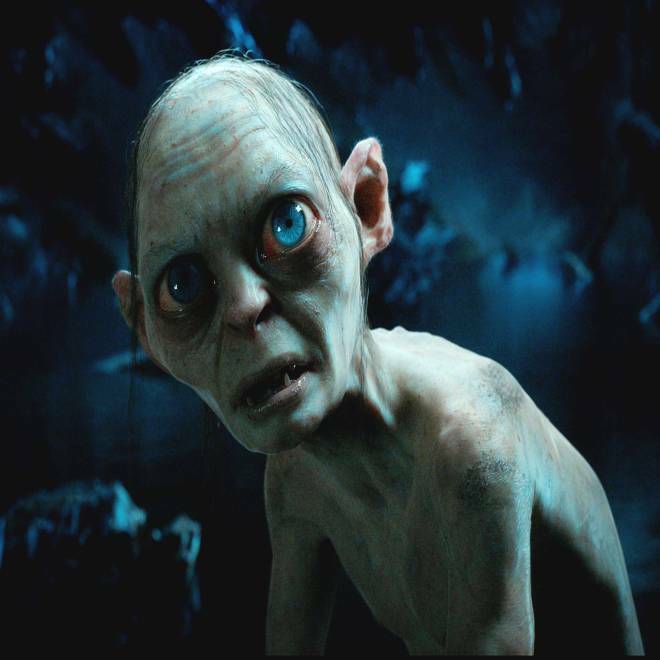 Simulation software that helped filmmakers create the character Gollum's skin for "The Hobbit: An Unexpected Journey" is one of the technologies recognized by the Academy of Motion Picture Arts and Sciences. Audiences know that Daniel Day-Lewis is not really Abraham Lincoln and that Anne Hathaway is not Fantine, but when they watched "Lincoln" or "Les Miserables," they believed. Those kinds of accomplishments are traditionally honored by the Academy of Motion Picture Arts and Sciences at a ceremony held a couple of weeks before the televised Oscar extravaganza. Saturday's Scientific and Technical Achievement awards ceremony will be at the Beverly Hills Hotel, co-hosted by Zoe Saldana and Chris Pine, who both starred in 2009's "Star Trek" reboot. Nine science and technological awards will honor a total of 25 innovators whose hardware and software have changed the process of moviemaking. Mocha Planar Tracking Software helped Natalie Portman sprout feathers in the 2010 film "Black Swan." Developed by a team including Shain and fellow award winners Philip McLauchlan, Allan Jaenicke, and John-Paul Smith, the software essentially tracks the movement of each on-screen digital picture element, or pixel, during a scene. This allows an artist to have more control over the final look and movement of a visual effect. Almost instantly, Mocha allowed artists to take the image of swan skin and feathers that they had created, attach it to Portman's arm, integrated the image into her skin. A still image shows how Wavelet Turbulence software can create wisps of virtual smoke that can take on any desired shape. In the 2011 film "Hugo," as Hugo Cabret runs through the clock tower trying to escape the train station inspector, it was Theodore Kim — a computer scientist at the University of California at Santa Barbara, and fellow award winners Nils Thuerey, Markus Gross and Doug James — who created the wisps of smoke that provided an extra cloak of invisibility. The Wavelet Turbulence software makes it easier for artists to control the final look of smoke clouds and fiery flames on screen. Bringing to life a computer-generated character like Gollum from the 2012 film "The Hobbit: An Unexpected Journey" was a unique challenge, because part of what made him appear so lifelike had to do with his skin and his movements. To make this work, a team of artists and scientists from Weta Digital, including award winners Simon Clutterbuck, Richard Dorling and James Jacobs, developed an approach they call "Tissue: A Physically-Based Character Simulation Framework." With a similar goal in mind, a group at Centropolis FX, including awardees J.P. Lewis, Nickson Fong and Matt Cordner, created the pose space deformation, or "PSD," technique. In the 2001 animated film, "Shrek," creating a rose-colored sunset was part art and part science for the team who worked at PDI/Dreamworks, including Daniel Wexler, Lawrence Kesteloot and Drew Olbrich. A screenshot shows the Light system at work. "We made a tool for artists to help them achieve new levels of creativity," said Wexler, now a chief executive officer at The11ers. "Lighters tell a story with light, and since a lighter's time is more valuable than a computer's time, we developed the Light system." "Katana is specialized for large-scale film production where there is lots of data or lots of team members involved," said LaVietes, a pipeline architect. He develops the software process that moves data between departments for final movie frame delivery. "The way Katana works, if I make a change to a scene, I only save that change, and you would see a flowchart of all the changes to this scene." Getting the lighting just right, making the characters appear lifelike and creating visual effects that take an audience's breath away is the goal of these Oscar award-wining screen scientists and ingenious engineers. When they do their job well, the audience doesn't even notice their work. Emilie Lorditch is an editor and writer for Inside Science TV. This report was originally published by Inside Science News Service as "Oscar Sci-Tech Awards Honor Ingenious Screen Science and Engineering." Copyright 2013 American Institute of Physics. Republished with permission.